Gifts, terrariums, you’re thinking, that’s for high rollers. Not true. They are for everybody. Just stop and think of what happens when you hear that a customer is sick and you send a get-well card. What salesman does that? So here comes this card to the guy in the hospital. He’s got nothing to do but watch television and wait for visitors. You send him a card and you know that this customer is going to remember you and talk about you to everybody who comes in: “I got a get-well card from Joe Girard, the fellow who sells Chevrolet’s.” Or you are a clothing salesman, and you send something to the fellow who runs the tailor shop when he is out sick. Now a customer comes in who wants to buy three suits, but he’s going on a trip and needs them tomorrow. If there is any way of getting those alterations done by tomorrow, you know that your friend in the tailor shop will do it for you. The more money you spend wisely, the more people you can put to work, talking you up, helping you sell, and buying. Whatever you do should be worth more than what it costs you. Think of how much it will do to get people to think of you as a nice guy and talk about you to their friends and relatives. But there are also important ways to invest your time. And one of the most important is thinking smart. Whatever your business is about, however it works, it can be improved. There is no perfect way to do business. You can always find some way to do things better if you spend enough time thinking about it. But you have to think in ways that will help you get new ideas. You have to look at the most tried-and-true methods as if you could rearrange them and make them work better for you. Here’s a classic example: A young man comes out of a life insurance company training program and starts looking for business. Everybody in the program has been told that one of the ways is to use a directory of business executives. So this young man does what he is told and gets hold of a copy of the directory. He sits down, opens the first page, and stops. He thinks to himself that 20 other guys who were in the training program are doing the same thing. They are all sitting down with the directory and opening it to the first page. Then he hits on a very simple, obvious idea that nobody else had suggested. Instead of opening the book to “A”, he opens it near the middle, at “N”. As a result, he calls prospects that hardly ever get called, he gets a lot of appointments, and he sells lots of insurance policies right from the start. That man is a very prosperous insurance agent now, and he believes that stopping to think of a better way to operate was the thing that contributed most of all to his success. He is always looking for new and different ways to approach the same old problems. And by looking, he probably finds them more often than other salespeople. I too kept looking for better ways to build my business and sell more. I am not trying to say that I invented everything that I do. I borrowed a lot of my ideas from other people and other businesses. Whatever idea’s you come up with, the important thing is not to be put off by the guys who tell you that you can’t do it because it has never been done before. Who says something won’t work because it hasn’t been done before? If that was true, there would never be anything new in the world. None of the inventions, none of the great new ideas, would exist. The biggest advantage you can get is to come up with a better way of reaching and selling your customers. Good ideas are always worth the time it takes to think of them. You should always be looking at new things to try and new ways to test the value of what you are already doing. That way you will be constantly looking to improve the most important product that you sell—which is you! 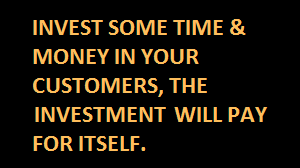 You have to make your own odds, by spending time and money to develop your own methods to bring in the customers and the money. Time and money well invested will build your business tremendously, and all of your business expenses are tax deductable. Always look for new and better ways to do it!